If ever a work of art merited comparison with epic poetry, "The Battle of Issus" is it. Albrecht Altdorfer's depiction of the moment in 333 B.C. when Alexander the Great routed Darius III for supremacy in Asia Minor is vast in ambition, sweeping in scope, vivid in imagery, rich in symbols, and obviously heroic—the Iliad of painting, as literary critic Friedrich Schlegel suggested. But Altdorfer (1480-1538) and his masterpiece are something of an art-world secret. Altdorfer was an etcher, engraver, architect and prominent public official in Regensburg, Germany, as well as a painter: Fewer than 50 paintings survive him. Like "The Battle of Issus," which hangs in Munich's Alte Pinakothek, most are owned by European museums. None can be found in North America; if anything, museums here own only prints and drawings. And Altdorfer flourished at time when Michelangelo, Raphael, Botticelli and other Italian Renaissance masters far overshadowed most Northern European artists in the common imagination. Albrecht Dürer, who was nine years older than Altdorfer, rightly rules as the genius of German artists in the period. In a back-handed compliment, "The Battle of Issus"—though signed in a prominent banner and with a monogram on the lower left—was once attributed to Dürer. In his time, though, Altdorfer was prosperous and powerful. The son of an artist, he knew of Dürer, Cranach and Italian artists such as Mantegna. A superb draftsman, with a bold sense of color and a bubbling imagination, Altdorfer was one of the most inventive artists of his age. Like his contemporaries, he painted religious scenes, portraits and historical works. Some portray fantastically detailed buildings that show off his architectural training. And he is credited as a founder of—and the best artist in—the Danube School, a circle that pioneered landscape as an independent genre. "He prised landscape out of a mere supplementary relationship to subject-matter," wrote Yale scholar Christopher Wood in "Albrecht Altdorfer and the Origins of Landscape" (1993). They were small, intimate works, mostly. "The Battle of Issus" is not a landscape, but the painting's monumental setting, beneath a swirling sky, shows his love of the genre, even as it sets the stage for a cosmic battle. At about 5 feet by 4 feet, it's neither small nor intimate. The work was commissioned in 1528 by Wilhelm IV, Duke of Bavaria, the first in a cycle of eight historical battle scenes destined to hang in the Residenz in Munich. At the time, Suleiman the Magnificent and his Ottoman armies were conquering much of the Middle East, North Africa and Europe, and the duke was about to begin a military campaign against these Turkish invaders. Altdorfer no doubt saw parallels between 1528 and Alexander's time. He turned down his chance to be mayor of Regensburg to take the commission. On first glance, "The Battle of Issus" is a Cecil B. DeMille production, with a swarming cast of thousands surrounding the central action: Alexander on his white steed, leading two rows of charging cavalrymen, dashes after a fleeing Darius, who looks anxiously over his shoulder from a chariot. Those who move on quickly, though, will miss the work's deeper charms. The painting, on limewood, can essentially be split horizontally. In the lower half, masses of men fight. The dead are underfoot. Spears and banners are tightly aligned on the Greek side, askew among the Persians. Altdorfer, playing to contemporary parallels, changed many small points. The men wear contemporary armor. Some Persians wear Turkish turbans. The men charge in formation, reflecting Middle Ages tactics, not ancient ones. Throughout, Altdorfer rendered the details meticulously: Leaves and feathers exhibit their veins, armor displays its shine, helmets show their insignia. The action is taking place in Asia Minor, and for the top half, Altdorfer paints a panorama that encompasses the eastern Mediterranean, from Greece to Egypt, and stretches to the heavens, too. Art historians say he derived this landscape from maps available at the time, but he also took his liberties. For one, he reversed what is now convention and placed south at the top. Beyond the eastern Mediterranean lies the island of Cyprus. Beyond that, on the left, is the Red Sea; across the isthmus, seven fingers of the Nile pierce the delta—an accurate description, as are the three lakes that source the river. But where did he get those unnaturally craggy mountain peaks that inhabit Asia Minor and stretch across what would be North Africa? The curious banner, bedecked in rose-colored swags and tassel, bisects the work; its cord points directly at Alexander. His inscription was originally written in German "in golden capital letters," according to the Alte Pinakothek, and his banner was twice its current height. It was shrunk and the writing replaced by an unknown hand at an unknown date—probably the late 16th or early 17th century—by a much shorter text in Latin. Actually, the entire painting was reduced in size, possibly to match others in the suite. A gleaming fireball of a sun, on the right, has perplexed the experts: It shines on Alexander's army, but is it rising or setting? The consensus says setting, with the slivered crescent moon, the Turkish symbol, rising in the left corner over the retreating Persians. The appearance of both heavenly bodies signifies the cosmic nature of the conflict—and was apparently meant to exhort the duke to likewise repel the Turks. 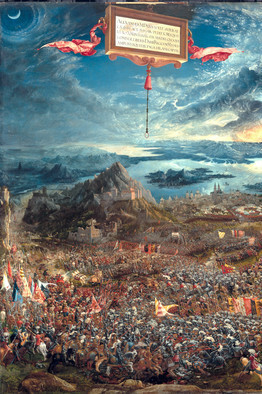 Altdorfer finished the painting in 1529; late that year, Suleiman was turned back at the Siege of Vienna. The overall spectacle is awesome in its flamboyance and intelligence. Yet some experts date its fame to 1800, when Napoleon's soldiers nabbed it as a spoil of war. They moved it to Paris, where it first hung in the Louvre. In 1814, the victorious Prussian army, which was said to have found the painting hanging in Napoleon's bathroom in St. Cloud, recaptured it. They recognized it as an epic achievement, and took it back to Munich.